Main en-GB Analytical materials Analytical materials / Kazakhstan Is It Possible to Reform the Kazakh Police in the Near Future? Political scientist, representative of the Civil Initiative "За реформу МВД" (Almaty). 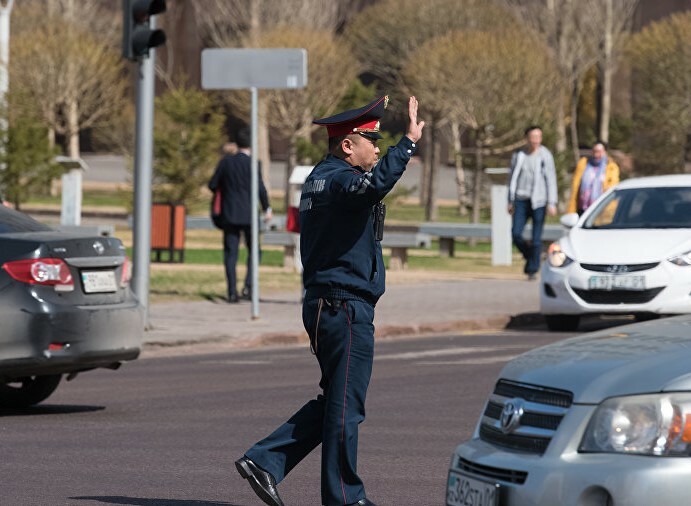 Is It Possible to Reform the Kazakh Police in the Near Future? “The activities of the police in Kazakhstan are mainly focused on protecting the regime and, to a lesser extent, on meeting the needs of the population for the protection of public order. The authorities began to demonstrate some readiness for limited reform only with the growth of social discontent. This is the main difference and hope that the reform agenda has a chance to form a movement in the right direction”, – political analyst Dimash Alzhanov notes in his article written specifically for the analytical platform CABAR.asia. Any MIA reform cannot be carried out in isolation, therefore large-scale political changes will be required. The Ministry of Internal Affairs (MIA) in Kazakhstan is the least reformed agency in the system of law enforcement agencies inherited from the Soviet period. Since 1991, the country’s leadership has not had a serious incentive to democratize the police, so the model of control over society through the militarized department has been maintained. All previous “reforms” of MIA were aimed at strengthening police power within the framework of the ruling regime’s needs and did not foresee a significant transformation of the department towards openness and accountability. Kazakhstan is a “police state”. The police in Kazakhstan are widely used to fight against political opponents. Police systematically violate the rights and freedoms of citizens. According to official data for 2018, there is one police officer for 221 citizens, which exceeds the European average of one to 300-400. In recent years, the state has invested in the technical equipment of the police, supported police officers and their families through the provision of preferential housing and a social package. In this sense, Kazakhstan is a “police state”. Political loyalty is a key element in the relationship between the police and the ruling regime in the current model. The loyalty is ensured through the disciplinary authority of the heads over the police and the ability to subjectively determine the career growth of each employee. A corruption component plays a significant role in this relationship. The police do not have independence in making operational decisions in such circumstances. They act by directions of the authorities or their compartmentalized and sometimes personal interests. In a country with no rule of law it leads to power abuse by the police in accordance with political necessity and catastrophically reduces its effectiveness in protection of public order. The request for a comprehensive reform of MIA on the part of society has been formed over the years – as the effectiveness of the police declines and mistrust to its activities grows. Participation in social and political processes in Kazakhstan is severely constrained. Therefore, the request for reform remained unrealized. The tragedy that occurred with the Olympic winner Denis Ten, led a social discontent regarding the work of the police into public space. More and more citizens began to demand the resignation of the Minister of Internal Affairs, promoting the thesis of police’s accountability to the society. More than 15 thousand reform supporters within four days joined the group on the social network Facebook.com “We demand reform of MIA”. Following this, a civil initiative “For the reform of MIA” was formed. It issued a public request for a comprehensive police reform in the form of a concept – “The New Police of Kazakhstan”. 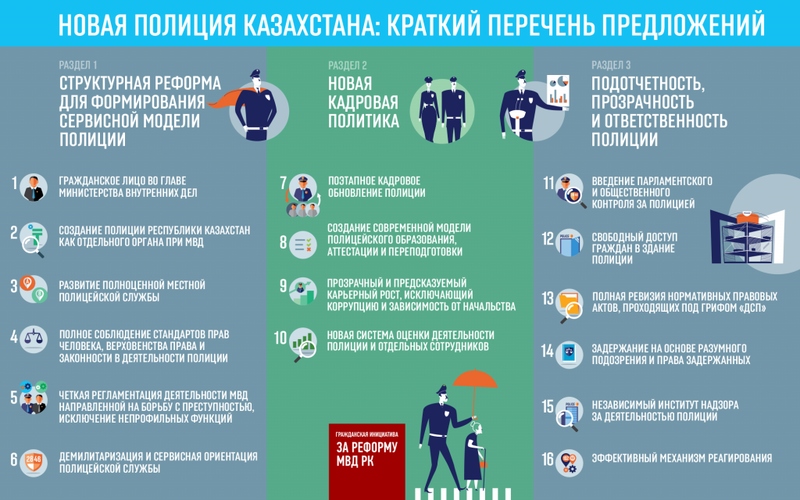 The concept “The New Police of Kazakhstan” was developed by the civil society and takes into account more than three hundred suggestions and recommendations from both average citizens and well-known independent experts. This document includes human rights standards and international best practices in organizing police service in a democratic society. The concept proposes to clearly distinguish between political and administrative functions within MIA, to decentralize the police and introduce parliamentary and public control over the police. It was proposed to the country’s leadership to create working groups with the participation of civil society and international experts at the level of the Security Council of Kazakhstan and the Parliament of Kazakhstan to openly discuss the main directions of the reform. The authorities have rejected these proposals. In parallel, in all major cities of the country by the initiative of individual citizens there were filed applications for holding 35 meetings for the reform of MIA. Applications were rejected in all cases. However, this revived the discussion of the public right to gather peacefully. The spontaneous mobilization of public opinion and the risk of politicizing the request prompted the authorities to respond. Relevant statements were made at the level of the country’s president after assessing public sentiment. They recognized the unsatisfactory work of the police and outlined the scope of the future reform. Its development was assigned to the Administration of President of the Republic of Kazakhstan and MIA. Following independence until 1998, the Soviet militia institute continued to exist without any major changes, except for an attempt to isolate the Investigative Committee from MIA in 1995. Militia was renamed to police by the analogy with international practice in 1998. However, the name change did not imply the demilitarization of the department. The penitentiary system was transferred to the Ministry of Justice of the Republic of Kazakhstan In 2002. The transfer was carried out in the forefront of the first large-scale penitentiary reform. At that time Kazakhstan became a leader in this direction among the countries of the former USSR. This was an important step in construction of a modern penitentiary system, but it was not supported by real changes and led to the return of penitentiary system to MIA structure in 2011. It was announced in 2003 about the reform of certain directions in the police activities, including personnel policy. MIA optimized the management structure and reduced the staff of territorial and transport departments of internal affairs, increasing the number of police officers in cities and regional centers. The reform did not entail any systemic changes in the work of MIA. The registration of individuals was transferred to the Ministry of Justice in 2005.The transfer of these functions would make sense if modern police gradually began to form in MIA system. First of all, the authorities should decide on the model of reforms. If we take the European MIA model, the functions of registration of individuals could be left at MIA. Bureaucratic redistribution of functions does not make much sense. In 2010, MIA was deprived of some of the functions; security activities and technical inspection of vehicles. Medical sobering station and temporary detention facilities were handed over to civilian departments. These changes were in the right way. Police officers should not work as guards or engage in activities that are not directly related to the suppression and investigation of criminal activity. Functions in the field of penitentiary system were transferred back to MIA in 2011. The penitentiary system was closed again, and the reform, which was launched in 2002 and received positive feedback from the OSCE and the UN, has been terminated. There was no clear explanation why prisons were returned to MIA, violating international standards. But there were references to several cases of prison breaches and a riot in one of the penal colony, where the prisoners sentenced for crimes of a terrorist nature were held. It is possible that the real cause was the interagency competition for resources. In the same year, the functions of documenting and registering the population were transferred back to MIA. They wanted to simultaneously improve the registration discipline of citizens’ applications. Problems in this area were partially resolved several years after the introduction of the Unified Register of Pre-Trial Investigations. It seems that one of MIA’s main tasks was to prevent any meetings and protests after the protests and shooting of the strikers in Zhanaozen and Shetpe on December 16, 2011. This task is still MIA’s priority. MIA is developing a state program in 2012 to modernize the law enforcement system for 2014–2020. The government approves this state program in December 2013. The concept of personnel policy of law enforcement agencies is adopted together with it. The modernization program is aimed at increasing the level of trust in police, expanding and standardizing public services. The program was also aimed at improving the procedure for registering applications and introducing a simplified form of pre-trial procedures. The units of the patrol and traffic police were combined into a road patrol service. The management system of the Internal Troops of the Republic of Kazakhstan is changing. In August 2016, the program is inexplicably terminated ahead of schedule. A local police service is created in January 2016. The police and local authorities are established to maintain public order protection. Akim has an opportunity (at the request of the minister) to appoint the head of the local police in coordination with maslikhat, as well as to formulate priorities for the local police activities. It should be noted that akim is not elected and he is not part of local government system, maslikhats can only be formally considered as “local representative bodies”. However, the idea was correct. For example, local police in the Netherlands are directly connected to local government. Police priorities are determined in collaboration with local communities. Local police are autonomous from the center in many aspects of its activities. These measures could set a positive direction for future changes even without deep going into decentralization issue. Unfortunately, the local police service reform was terminated in July 2018. The official reason was the inefficiency and duplication of functions of the Department of Internal Affairs. But the real problem was that the established Local Police Service could not institutionally rely on local government (which does not exist). The Local Police Service hung between MIA and Akim in a centralized management system, without communication with the local community and without resources. The local police were incorporated with the Department of Internal Affairs and renamed to Police Departments. The experiment with the Local Police Service showed once again that many changes in law enforcement will remain an imitation, without reforms of the political system and the development of local government. A ban on the use of police batons was introduced in January 2017. In conclusion, it should be noted that the reform of the Ministry of Internal Affairs has not progressed beyond single changes (baton). Some measures returned the country to the old vicious practices of police control; others had only a declarative character. Attempts of the authorities to reform MIA from above did not bring any tangible results for the society. First, all measures were unilaterally developed and applied without the participation of civil society and did not reflect the society’s needs. Second, the authorities tried to optimize management, “increase efficiency” and redistribute functions (budget funds), guided by compartmentalized interests through the reform. Moreover, all these measures without introducing the principles of good governance, transparency and accountability could not be effective. Third, the reform was not aimed at regaining public trust in work of police. Although, the trust must be a key criterion in evaluating police activities. 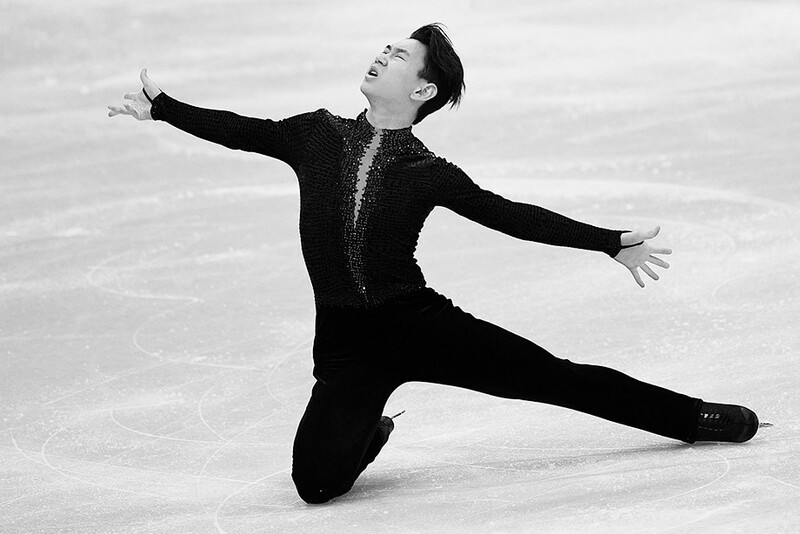 After the death of Denis Ten in 2018, Kazakh society demanded decisive actions from the authorities. For two months there were no clear statements from the leadership of the country. Only in September 2018, the Ministry of Internal Affairs announced the opening of front offices under the police departments to improve the admission of citizens and complaints. The front offices still do not have a common unified look, in some cases they are improvised structures / rooms, access to which is still difficult. The Almaty Police Department has increased the staff of the dispatch service 102. In November 2018, President Nursultan Nazarbayev spoke out about the reform. He announced plans to reduce management personnel in police by 10 percent through re-evaluation. The money saved will be spent on raising salaries for the remaining police officers. The president also said that we should expect the introduction of a new format of police interaction with citizens, which should contribute to a friendly police officer’s image formation. Later that month, the minister introduced a new police uniform; its draft was put up for public discussion until final approval. The actions of the authorities in the context of “swift victories” were limited by these steps. On November 19, 2018, MIA published a roadmap on the modernization of Kazakh law enforcement agencies for 2019-2021. The document contains provisions aimed at optimizing the organizational and staffing structure, improving the remuneration system and social protection of employees. Selection and training of employees, modernization of departmental education are also included in the list of proposed measures. Additionally, MIA plans to exclude uncharacteristic functions and intends to fight against corruption. The roadmap reflects only a small part of the requirements of civil society. A positive example is the desire of the authorities to reorganize MIA universities into police academies, i.e. to ensure policeman’s training in a generally accepted format. 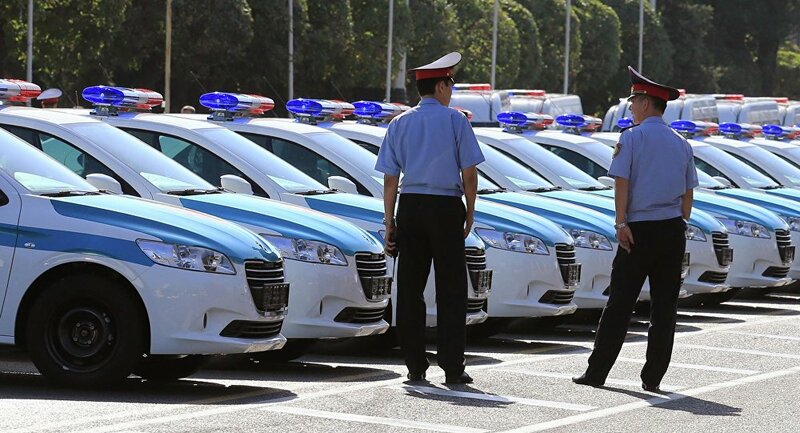 There are also plans to convert combat units into patrol police, and introduce new methods of training police officers with obligatory service in patrol units. According to the reform plan, the police will no longer be involved in the protection of cultural events. The roadmap proposes to study the issue of introducing compulsory wearing of body cameras without the possibility to disable recording, for all police that are in contact with the population. A unified dispatch service 112 should be created to service all emergency calls. However, civil society’s proposals related to the comprehensive reform of MIA to form a politically neutral and accountable police were ignored. The roadmap does not contain measures aimed at introduction of police oversight institutions and mechanisms. Moreover, the MIA project does not detail the procedure for official evaluation and does not provide for the participation of independent experts in the work of certifying commissions. Such an approach will lead to the fact that the re-evaluation will only be passed by the staff loyal to management. At the same time, MIA does not plan to engage independent experts to analyze and evaluate Departments of Internal Affairs and their internal processes for their effectiveness and corruption. Such a policy of the authorities will not contribute to a radical improvement of the situation and will inevitably undermine citizens’ trust in the reform. The roadmap does not resemble a police reform action plan; it does not have a system. It is also not clear when the announced changes will be made. Georgia, Moldova and Ukraine are among the well-known examples of police reform in the CIS countries. They are common by the fact that the reform of MIA took place against the background of broad political changes. In the case of Georgia, police reform was carried out after the change of power. The police was one of the most corrupt structures, closely related to organized crime. The rapid anti-corruption campaign in state bodies, including the police, was successful thanks to institutional changes and a zero tolerance policy of corruption and crime, sometimes including punitive measures beyond the law. A political will of President Saakashvili was a determining factor that shaped the formation of the new police. Police reforming began from scratch through personnel recruitment. The authorities were able to significantly reduce and update the staff of the ministry and the police. The patrol police came to replace the car inspection, which is now involved not only in the organization of traffic, but also responds to all types of offences. Starting from 2006, Georgia in cooperation with the United States introduced an American model of a patrolman. In order to ensure maximum physical transparency, many of the country’s police stations were equipped with glass walls, so that all the work of the police was really in the sight of the citizens. The Georgian authorities did not switch to a decentralized police model, preferring to maintain control of the central authorities. However, the authorities of the territorial and district police departments, as well as local police stations, were minimally expanded. Territorial bodies received the right to conduct financial and personnel policy independent from the center (the budget is allocated by the ministry). The appointment of heads of territorial police departments remains under the ministry. The penitentiary system and temporary detention facilities under police administration were transferred to a special Office for the Supervision over compliance with Human Rights. The Human Rights Ombudsman was given the right to visit detention facilities without any restriction. It was the Ombudsman’s reports that later helped to identify cases of torture and abuse. It cannot be said that Georgian police were properly depoliticized and fully accountable to society. However, it is clear that it has become a less corrupt and more service oriented service. There are recent cases of police intervention in the election process. In general, the Georgian police are still in the reform process. The Georgian version of the reform can be successfully implemented in Kazakhstan. This requires the firm political will of the country’s leadership and incentives for change. It is likely that at first the police will be far from the ideal model as in Georgia, but it has the chance to change the paradigm from the repressive model towards the service one. 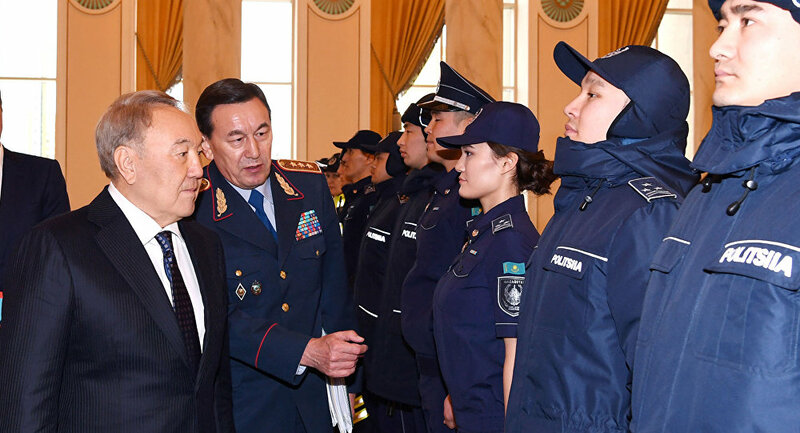 The activities of the police in Kazakhstan are mainly focused on protecting the regime and, to a lesser extent, on meeting the needs of the population for the protection of public order. The excessive control and influence of the political leadership of the country on the police ultimately led to corruption and a decrease in its professionalism. Since the society did not require reforms through active and organized participation in the political process, the authorities did not have incentives to create procedures and rules of the police that are clear and accountable to the public. All initiatives to reform MIA were carried out within the framework of the current authoritarian system and reflected the interests of the regime. The authorities began to demonstrate some readiness for limited reform only with the growth of public discontent. The list of proposed innovations still does not fundamentally change the relationship between the state, the police and society. Actually, it does not go beyond the measures that characterized the reforms until 2018. The police control paradigm still dominates. However, the authorities began to react for the first time under the pressure of public opinion. This is the main difference and hope that the reform agenda has a chance to form a movement in the right direction. Any MIA reform cannot be carried out in isolation, therefore large-scale political changes will be required. Reform the existing police procedures and mechanisms for responding to citizens’ complaints and appeals. Meeting on the modernization of the law enforcement agencies under the chairmanship of the President, November 19, 2018. On the measures taken of the administrative reform in law enforcement agencies in 2008. Decree of the President of the Republic of Kazakhstan dated August 17, 2010 No. 1039 “On measures to increase the effectiveness of law enforcement and the judicial system in the Republic of Kazakhstan”. On the reform of law enforcement agencies in 2011. Information about the main directions to reform the law enforcement agencies of the Republic of Kazakhstan. On measures for the further development of the law enforcement system of the Republic of Kazakhstan 2013. Decree of the Government of the Republic of Kazakhstan dated August 18, 2016 No. 464. Law of the Republic of Kazakhstan dated November 2, 2015 No. 388-V “On Amendments and Additions to Certain Legislative Acts of the Republic of Kazakhstan on the Activities of the Local Police Service”. Decree of the Government of the Republic of Kazakhstan dated December 30, 2015 No. 1142 “On approval of the Regulations on the local police service of the law enforcement agencies”. The police in the Netherlands consist of the National Police Service Agency and ten regional agencies. Each regional service is headed by a police council, which includes the mayor. For example, the United Kingdom of Great Britain and Northern Ireland is divided into 45 police departments and all of them are autonomous from each other, there is no single center. The draft form can be found on the official instagram account of the Ministry of Internal Affairs of Kazakhstan. Roadmap for the modernization of law enforcement agencies of the Republic of Kazakhstan for 2019-2021.